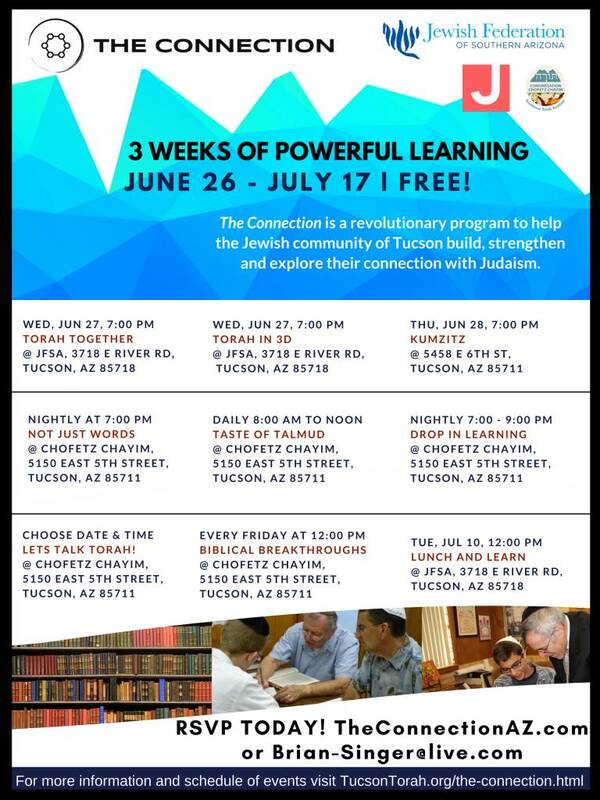 The Connection is a 3 week revolutionary program with the goal to help the Jewish community of Tucson build, strengthen and explore their connection with Judaism. Flexibility is key; set your own schedule and come one time or as many as you want. 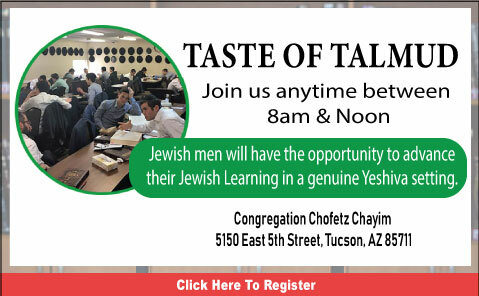 Join our Taste of Talmud anytime between 8am-noon for an exciting exploration of the world of Talmud and Gemorrah. All children 2- to 6-years-old welcome! Each camp week a different theme: Sports, Art & Music, Outdoors, America the Great, Science and Around the World. Also kids can enjoy water play, stories, music, creative movement, playground time and more. Secure facility with a beautiful, park-like shaded playground. Snacks provided. Mon-Fri; Full days 9:00am – 3:00pm; Half days 9:00am – 12:30pm; Before/After Care 8:00-9:00am and/or 3:00-4:00pm daily $8 per child, per hour. 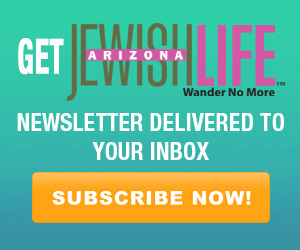 (Discounts offered for synagogue members.) Non-refundable registration fee $100. “Wearing Our Stories” is an exhibit of mixed media drawings sub-dyed onto textiles and meant to be touched, worn, stretched, and used. Creating wearable art is an exciting opportunity to make art more accessible and approachable taking it beyond gallery walls and out onto the streets. Every body every shape and every color changes the aesthetic of the original artwork in a unique and exciting way. For more information about Lauri Kaye, visit her website. 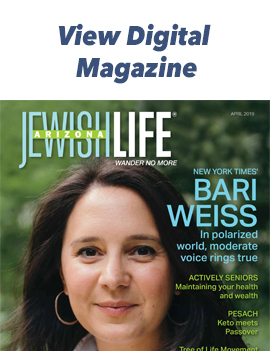 Introduction to Ethics with Professor Jerry Gil, Ph.D. at Tucson Jewish Community Center, 3800 E. River Road, Tucson from 1 to 3 pm. Explore the thought of the great thinkers of Western philosophy from Plato and Aristotle through Kant and Mill to MacIntyre and Rawls. $60 for six weeks. For more information, visit tucsonjcc.org. Celebrate summer every Monday at the museum with $3 admission, extended hours and special guests. Guests will be at the museum from 3 to 6 pm and the museum is open until 7 pm. For more information, visit childrensmuseumtucson.org. 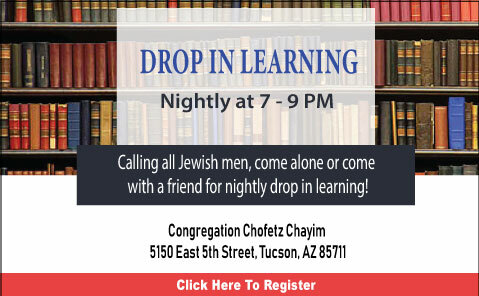 Calling all Jewish men, join our nightly learning session anytime between 7-9pm! Come solo or bring a friend! Bring something to learn or have one of our amazing connectors guide your learning. There are no time requirements, you can learn from 5 minutes or 2 hours. Learning together we will reach new connections to Judaism. 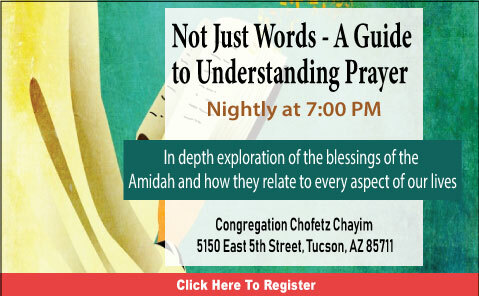 The words of the Daliy Amidah are transformative and have the ability to help you through every aspect of your life. Only by understanding the deeper meaning of each blessing can we become truly empowered. Your newly gained insight will enable you to tap into the deepest recesses of your heart.